Cauliflower steaks, cut from the center of a whole head of the vegetable, have gone from vegetarian novelty to staple but—let’s hope—not yet to cliché. Cauliflower steaks, cut from the center of a whole head of the vegetable, have gone from vegetarian novelty to staple but—let’s hope—not yet to cliché. Brushing the richly browned “steaks” with sweet-tart pomegranate molasses make them look even meatier. Admittedly, the pairing here is a tough one, but I think a ripe and fruity rosé is up for the challenge. 1. Preheat the oven to 375°. Cut two 1 1/2-inch thick center slices from the head of cauliflower to form “steaks.” Reserve the remaining cauliflower for another use. 2. In a large cast-iron skillet, heat the olive oil until shimmering. Season both sides of the cauliflower with salt, pepper and cumin; add to the skillet and cook, pressing, until nicely browned on the bottom, about 3 minutes. Flip the steaks, transfer the skillet to the oven and roast until the cauliflower is tender, about 20 minutes. 3. Meanwhile, in a bowl, toss the quinoa with the herbs and three-quarters of the pistachios. Season generously with salt and pepper. 4. 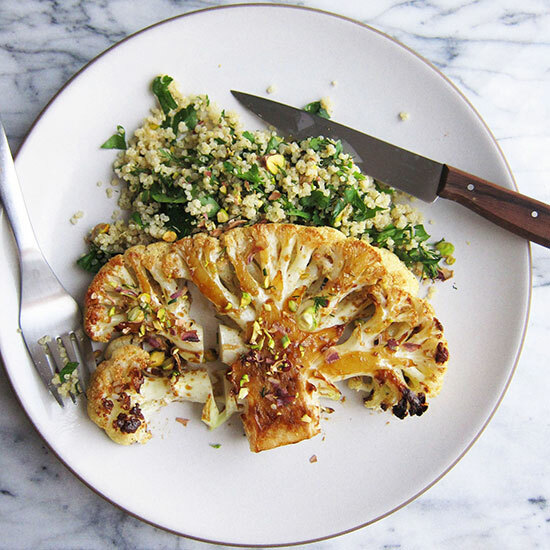 Remove the cauliflower steaks from the oven and generously brush the tops with pomegranate molasses. Transfer the steaks to plates, leaving as much of the oil as possible behind. Serve with the Herby Quinoa, sprinkling the remaining pistachios over the top. Note Pomegranate molasses is available at Middle Eastern markets or from kalustyans.com. One serving 467 cal, 18 gm fat, 2 gm sat fat, 66 gm carb, 13 gm fiber, 16 gm protein. Wine A lush, fruity rosé, like the 2012 Château de Manissy Tavel Cuvée des Lys.